Elizabeth Bishop (February 8, 1911 – October 6, 1979) was an American poet and short-story writer. She was Consultant in Poetry to the Library of Congress from 1949 to 1950, the Pulitzer Prize winner for Poetry in 1956, the National Book Award winner in 1970, and the recipient of the Neustadt International Prize for Literature in 1976. She is considered one of the finest poets of the 20th century. Elizabeth Bishop, an only child, was born in Worcester, Massachusetts, United States, to William Thomas and Gertrude May (Bulmer) Bishop. After her father, a successful builder, died when she was eight months old, Bishop's mother became mentally ill and was institutionalized in 1916. (Bishop would later write about the time of her mother's struggles in her short story "In The Village.") Effectively orphaned during her very early childhood, she lived with her grandparents on a farm in Great Village, Nova Scotia, a period she also referred to in her writing. Bishop's mother remained in an asylum until her death in 1934, and the two were never reunited. Later in childhood, Bishop's paternal family gained custody. She was removed from the care of her grandparents and moved in with her father's wealthier family in Worcester, Massachusetts. However, Bishop was unhappy there, and her separation from her maternal grandparents made her lonely. While she was living in Worcester, she developed chronic asthma, from which she suffered for the rest of her life. Her time in Worcester is briefly chronicled in her poem "In The Waiting Room." In 1918, her grandparents, realizing that Bishop was unhappy living with them, sent her to live with her mother's oldest sister, Maude Bulmer Shepherdson, and her husband George. The Bishops paid Maud to house and educate their granddaughter. The Shepherdsons lived in a tenement in an impoverished Revere, Massachusetts neighborhood populated mostly by Irish and Italian immigrants. The family later moved to better circumstances in Cliftondale, Massachusetts. It was Bishop's aunt who introduced her to the works of Victorian poets, including Alfred, Lord Tennyson, Thomas Carlyle, Robert Browning, and Elizabeth Barrett Browning. Bishop was very ill as a child and, as a result, received very little formal schooling until she attended Saugus High School for her freshman year. She was accepted to the Walnut Hill School in Natick, Massachusetts for her sophomore year but was behind on her vaccinations and not allowed to attend. Instead she spent the year at the North Shore Country Day School in Swampscott, Massachusetts. Bishop then boarded at the Walnut Hill School, where she studied music. At the school her first poems were published by her friend Frani Blough in a student magazine. Then she entered Vassar College in Poughkeepsie, New York in the fall of 1929, shortly before the stock market crash, planning to be a composer. She gave up music because of a terror of performance and switched to English where she took courses including 16th and 17th century literature and the novel. Bishop published her work in her senior year in The Magazine (based in California). In 1933, she co-founded Con Spirito, a rebel literary magazine at Vassar, with writer Mary McCarthy (one year her senior), Margaret Miller, and the sisters Eunice and Eleanor Clark. Bishop graduated from Vassar with a bachelor's degree in 1934. Bishop was greatly influenced by the poet Marianne Moore, to whom she was introduced by a librarian at Vassar in 1934. Moore took a keen interest in Bishop's work and, at one point, Moore dissuaded Bishop from attending Cornell Medical School, where the poet had briefly enrolled herself after moving to New York City following her Vassar graduation. Regarding Moore's influence on Bishop's writing, Bishop's friend and Vassar peer, the writer Mary McCarthy stated, "Certainly between Bishop and Marianne Moore there are resemblances: the sort of close microscopic inspection of certain parts of experience. 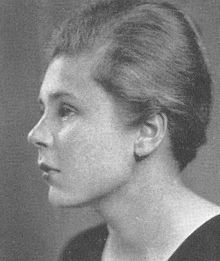 [However,] I think there is something a bit too demure about Marianne Moore, and there's nothing demure about Elizabeth Bishop." Moore helped Bishop first publish some of her poems in an anthology called Trial Balances in which established poets introduced the work of unknown, younger poets. It was four years before Bishop addressed "Dear Miss Moore" as "Dear Marianne" and only then at the elder poet's invitation. The friendship between the two women, memorialized by an extensive correspondence (see One Art), endured until Moore's death in 1972. Bishop's "At the Fishhouses" (1955) contains allusions on several levels to Moore's 1924 poem "A Grave." She was introduced to Robert Lowell by Randall Jarrell in 1947, and they became great friends, mostly through their written correspondence, until Lowell's death in 1977. After his death, she wrote, "our friendship, [which was] often kept alive through years of separation only by letters, remained constant and affectionate, and I shall always be deeply grateful for it." They also influenced each other's poetry. Lowell cited Bishop's influence on his poem "Skunk Hour" which he said, "[was] modeled on Miss Bishop's 'The Armadillo.'" Also, his poem "The Scream" is "derived from...Bishop's story In the Village." "North Haven," one of the last poems she published during her lifetime, was written in memory of Lowell in 1978. Bishop had a large independent income from early adulthood, as a result of an inheritance from her deceased father, that did not run out until near the end of her life. This income allowed her to travel widely, though cheaply, without worrying about employment, and to live in many cities and countries which are described in her poems. She wrote frequently about her love of travel in poems like "Questions of Travel" and "Over 2000 Illustrations and a Complete Concordance." She lived in France for several years in the mid-1930s with a friend from Vassar, Louise Crane, who was a paper-manufacturing heiress. In 1938, the two of them purchased a house at 624 White Street in Key West, Florida. While living there Bishop made the acquaintance of Pauline Pfeiffer Hemingway, who had divorced Ernest Hemingway in 1940. She later lived in an apartment at 611 Frances Street. From 1949 to 1950, she was the Consultant in Poetry for the Library of Congress, and lived at Bertha Looker's Boardinghouse, 1312 30th Street Northwest, Washington, D.C., in Georgetown. Upon receiving a substantial ($2,500) traveling fellowship from Bryn Mawr College in 1951, Bishop set off to circumnavigate South America by boat. Arriving in Santos, Brazil in November of that year, Bishop expected to stay two weeks but stayed 15 years. She lived in Petrópolis with architect Lota (Maria Carlota) de Macedo Soares, who was descended from a prominent and notable political family. Although Bishop was not forthcoming about details of her romance with Soares, much of their relationship was documented in Bishop's extensive correspondence with Samuel Ashley Brown. However, the relationship deteriorated in its later years, becoming volatile and tempestuous, marked by bouts of depression, tantrums and alcoholism. The relationship is depicted in the 2013 film Reaching for the Moon. During her time in Brazil Bishop became increasingly interested in the languages and literatures of Latin America. She was influenced by South and Central American poet, including the Mexican poet Octavio Paz and the Brazilian poets João Cabral de Melo Neto and Carlos Drummond de Andrade, and translated their work into English. Regarding de Andrade, she said, "I didn't know him at all. He's supposed to be very shy. I'm supposed to be very shy. We've met once — on the sidewalk at night. We had just come out of the same restaurant, and he kissed my hand politely when we were introduced." After Soares took her own life in 1967, Bishop spent more time in the United States. For a major American poet, Bishop published very sparingly. Her first book, North & South, was first published in 1946 and won the Houghton Mifflin Prize for poetry. This book included important poems like "The Man-Moth" (which describes a dark and lonely fictional creature inspired by what Bishop noted was "[a] newspaper misprint for 'mammoth'") and "The Fish" (in which Bishop describes a caught fish in exacting detail). But she didn't publish a follow-up until nine years later. That volume, titled Poems: North & South—A Cold Spring, first published in 1955, included her first book, plus the 18 new poems that constituted the new "Cold Spring" section. Bishop won the Pulitzer Prize for this book in 1956. Then there was another long wait before her next volume, Questions of Travel, in 1965. This book showed the influence that living in Brazil had had on Bishop's writing. It included poems in the book's first section that were explicitly about life in Brazil including "Arrival at Santos," "Manuelzinho," and "The Riverman." But in the second section of the volume Bishop also included pieces set in other locations like "In the Village" and "First Death in Nova Scotia", which take place in her native country. Questions of Travel was her first book to include one of her short stories (the aforementioned "In the Village"). Bishop's next major publication was The Complete Poems (1969), which included eight new poems and won a National Book Award. The last new book of poems to appear in her lifetime, Geography III (1977), included frequently anthologized poems like "In the Waiting Room" and "One Art." This book won Bishop the Neustadt International Prize for Literature, which no woman had won before and no other American has ever won. Bishop's The Complete Poems, 1927–1979 was published posthumously in 1983. Other posthumous publications included The Collected Prose (1984; a compilation of her essays and short stories) and Edgar Allan Poe & the Juke-box: Uncollected Poems, Drafts, and Fragments (2006), whose publication aroused some controversy. Meghan O'Rourke notes in an article from Slate magazine, "It's no wonder ... that the recent publication of Bishop's hitherto uncollected poems, drafts, and fragments ... encountered fierce resistance, and some debate about the value of making this work available to the public. In an outraged piece for The New Republic, Helen Vendler labeled the drafts 'maimed and stunted' and rebuked Farrar, Straus and Giroux for choosing to publish the volume." Where some of her notable contemporaries like Robert Lowell and John Berryman made the intimate details of their personal lives an important part of their poetry, Bishop avoided this practice altogether. In contrast to this confessional style involving large amounts of self-exposure, Bishop's style of writing, though it sometimes involved sparse details from her personal life, was known for its highly detailed, objective, and distant point of view and for its reticence on the kinds of personal subject matter that the work of her contemporaries involved. She used discretion when writing about details and people from her own life. "In the Village", a piece about her childhood and mentally unstable mother, is written as a third person narrative, and so the reader would only know of the story's autobiographical origins by knowing about Bishop's childhood. Bishop did not see herself as a "lesbian poet" or as a "female poet". Because she refused to have her work published in all-female poetry anthologies, other female poets involved with the women's movement thought she was hostile towards the movement. For instance, a student at Harvard who was close to Bishop in the 60s, Kathleen Spivack, wrote in her memoir, "I think Bishop internalized the misogyny of the time. How could she not? ... Bishop had a very ambivalent relation to being a woman plus poet—plus lesbian—in the Boston/Cambridge/Harvard nexus ... Extremely vulnerable, sensitive, she hid much of her private life. She wanted nothing to do with anything that seemed to involve the women's movement. She internalized many of the male attitudes of the day toward women, who were supposed to be attractive, appealing to men, and not ask for equal pay or a job with benefits." However, this was not how Bishop necessarily viewed herself. In an interview with The Paris Review from 1978, she said that, despite her insistence on being excluded from female poetry anthologies, she still considered herself to be "a strong feminist" but that she only wanted to be judged based on the quality of her writing and not on her gender or sexual orientation. Although generally supportive of the "confessional" style of her friend, Robert Lowell, she drew the line at his highly controversial book The Dolphin (1973), in which he used and altered private letters from his ex-wife, Elizabeth Hardwick (whom he divorced after 23 years of marriage), as material for his poems. In a letter to Lowell, dated March 21, 1972, Bishop strongly urged him against publishing the book: "One can use one's life as material [for poems]—one does anyway—but these letters—aren't you violating a trust? IF you were given permission—IF you hadn't changed them... etc. But art just isn't worth that much." Bishop's "In the Waiting Room", written in 1976, addressed the chase for identity and individuality within a diverse society as a seven-year-old girl living in Worcester, Massachusetts during World War I.
Bishop's poem "First Death in Nova Scotia", first published in 1965, describes her first encounter with death when her cousin Arthur died. In this poem, her experience of that event is through a child's point of view. The poem highlights that although young and naive the child has some instinctive awareness of the severe impact of death. She combines reality and imagination, a technique also used in her poem "Sestina". Bishop's poem "Sestina", published in 1965, depicts a real-life experience. After her father's death when she was a baby and following her mother's nervous breakdown when she was 5, Bishop's poem notes her experience is after she has gone to live with relatives. The poem is about her living with the knowledge that she would not get to see her mother again. Bishop writes, "Time to plant tears, says the almanac. / The grandmother sings to the marvelous stove / and the child draws another inscrutable house." The style of her poem, the Sestina, is a poetry style created by Arnaut Daniel in the 12th century, focused on the emphases of ending words in each line, giving the poem a sense of form and pattern. Bishop is widely known for her skill in the Sestina format. Bishop lectured in higher education for a number of years starting in the 1970s when her inheritance began to run out. For a short time she taught at the University of Washington, before teaching at Harvard University for seven years. She often spent her summers in her summer house in the island community of North Haven, Maine. She taught at New York University, before finishing at the Massachusetts Institute of Technology. She commented, "I don’t think I believe in writing courses at all, It’s true, children sometimes write wonderful things, paint wonderful pictures, but I think they should be discouraged." In 1971 Bishop began a relationship with Alice Methfessel. Never a prolific writer, Bishop noted that she would begin many projects and leave them unfinished. Two years after publishing her last book, Geography III (1977), she died of a cerebral aneurysm in her apartment at Lewis Wharf, Boston. She is buried in Hope Cemetery (Worcester, Massachusetts). Alice Methfessel was her literary executor. Her requested epitaph, the last two lines from her poem "The Bight" — "All the untidy activity continues, / awful but cheerful" — was added, along with her inscription, to the family monument in 1997, on the occasion of the Elizabeth Bishop Conference and Poetry Festival in Worcester. 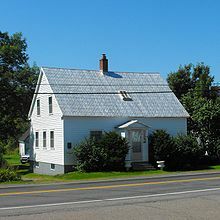 After her death, the Elizabeth Bishop House, an artists' retreat in Great Village, Nova Scotia, was dedicated to her memory. Reaching for the Moon (2013) is a Brazilian movie about Bishop's life when she was living in Brazil with Lota de Macedo Soares. The Portuguese title of the film is Flores Raras. Author Michael Sledge published the novel The More I Owe You, about Bishop and Soares, in 2010. Bishop's friendship with Robert Lowell was the subject of the play "Dear Elizabeth," by Sarah Ruhl, which was first performed at the Yale Repertory Theater in 2012. The play was adapted from the two poets' letters which were collected in the book Words in Air: The Complete Correspondence Between Elizabeth Bishop and Robert Lowell. ^ a b c "Poetry". Past winners & finalists by category. The Pulitzer Prizes. Retrieved 2008-04-25. ^ a b c "National Book Awards – 1970". National Book Foundation. Retrieved 2012-04-07. ^ "The Nobel Prize in Literature Takes This Year Off. Our Critics Don't". Retrieved September 23, 2018. ^ "Elizabeth Bishop". Worcester Area Writers. Worcester Polytechnic Institute. Archived from the original on September 5, 2008. Retrieved April 25, 2008. ^ a b Millier, Brett C. (1995). Elizabeth Bishop: Life and the Memory of It. University of California Press. ISBN 9780520203457. ^ "Elizabeth Bishop". Walnut Hill School. Archived from the original on May 9, 2008. Retrieved April 25, 2008. ^ "Elizabeth Bishop, American Poet". Elizabeth Bishop Society. Vassar College. Retrieved April 25, 2008. ^ "Elizabeth Bishop – Poet". ^ Kalstone, David. Becoming a Poet: Elizabeth Bishop with Marianne Moore and Robert Lowell. University of Michigan Press (2001): 4. In an early letter to Moore, Bishop wrote: "[W]hen I began to read your poetry at college I think it immediately opened up my eyes to the possibility of the subject-matter I could use and might never have thought of using if it hadn't been for you.—(I might not have written any poems at all, I suppose.) I think my approach is so much vaguer and less defined and certainly more old-fashioned—sometimes I'm amazed at people's comparing me to you when all I'm doing is some kind of blank verse—can't they see how different it is? But they can't apparently." ^ a b Voices and Visions Series. Elizabeth Bishop Episode. New York Center for Visual History: New York, 1988. ^ Stewart, Susan (2002) Poetry and the Fate of the Senses. University of Chicago Press 141, 357 fn.78 and fn.79). ^ Bishop, Elizabeth. Poems, Prose, and Letters. New York: Library of America, 2008. 733. ^ Lowell, Robert (2003) Collected Poems New York: Farrar, Straus, and Giroux, p1046. ^ Lowell, Robert. (2003) Collected Poems New York: Farrar, Straus, and Giroux p326. ^ O'Rourke, Meghan. "Casual Perfection: Why did the publication of Elizabeth Bishop's drafts cause an uproar?" Slate. 13 June 2006. ^ Bishop, Elizabeth. "In the Village." Questions of Travel. ^ Spivack, Kathleen. Robert Lowell and His Circle: Sylvia Plath, Anne Sexton, Elizabeth Bishop, Stanley Kunitz, and Others. Boston: Northeastern University Press, 2012. ^ Words in Air: the Complete Correspondence between Elizabeth Bishop and Robert Lowell. Ed. Thomas Travisano and Saskia Hamilton. New York: Farrar, Straus, and Giroux, 2008. ^ Ruby (January 24, 2012). "Elizabeth Bishop: Sestina". Elizabeth Bishop. Retrieved March 9, 2018. ^ McNamarra, Robert. "Sestina". staff.washington.edu. Retrieved March 9, 2018. ^ "Analysis of Sestina by Elizabeth Bishop". Owlcation. Retrieved March 9, 2018. ^ Wilson, Scott. Resting Places: The Burial Sites of More Than 14,000 Famous Persons, 3d ed. : 2 (Kindle Locations 3979–3980). McFarland & Company, Inc., Publishers. Kindle Edition. ^ "Questions of Travel". The New York Times, July 9, 2010. ^ "Book of Members, 1780–2010: Chapter B" (PDF). American Academy of Arts and Sciences. Retrieved April 10, 2011. Costello, Bonnie (1991). Elizabeth Bishop: Questions of Mastery. Cambridge: Harvard University Press. ISBN 0-674-24689-6. Kalstone, David (1989). Becoming a Poet: Elizabeth Bishop with Marianne Moore and Robert Lowell. New York: Farrar Straus Giroux. ISBN 0-374-10960-5. Millier, Brett (1993). Elizabeth Bishop: Life and the Memory of It. Berkeley: University of California Press. ISBN 0-520-07978-7. Nickowitz, Peter. Rhetoric and Sexuality: The Poetry of Hart Crane, Elizabeth Bishop, and James Merrill. Palgrave Macmillan: New York, 2006. Ostrom, Hans. "Elizabeth Bishop’s ‘The Fish,’" in a Reference Guide to American Literature, ed. Thomas Riggs. Detroit: St. James Press, 1999. Page, Chester (2007). Memoirs of a Charmed Life in New York. iUniverse. p. 77. ISBN 978-0-595-69771-7. Travisano, Thomas (1988). Elizabeth Bishop: Her Artistic Development. Charlottesville: University Press of Virginia. ISBN 0-8139-1159-1. Profile and works at Modern American Poetry. This page is based on the Wikipedia article Elizabeth Bishop; it is used under the Creative Commons Attribution-ShareAlike 3.0 Unported License (CC-BY-SA). You may redistribute it, verbatim or modified, providing that you comply with the terms of the CC-BY-SA.